Tasks – Assign a new task to a user, role, or record owner. Email Alerts – Send an email to one or more recipients you specify. Field Updates – Update the value of a field on a record. Outbound Messages – Send a secure configurable API message (in XML format) to a designated listener. To create workflow rule, go to App Setup | Workflow & Approvals | Workflow rules and click on new Workflow rule. Step 1 in creating workflow rule is selecting the object, on which the workflow will be created. When a record is created, or when a record is edited and did not previously meet the rule criteria: Choose this option to include new records and updates to existing records, unless the rule just ran and still meets the rule criteria. The rule is not re-triggered on edits that do not affect rule criteria. For example, if setting an opportunity rating to “Hot” causes the rule to run, with this option, the rule will run again only if the rating changes, then changes back to “Hot”””no matter how many times you edit the object. Only when a record is created: Choose this option to ignore updates to existing records. 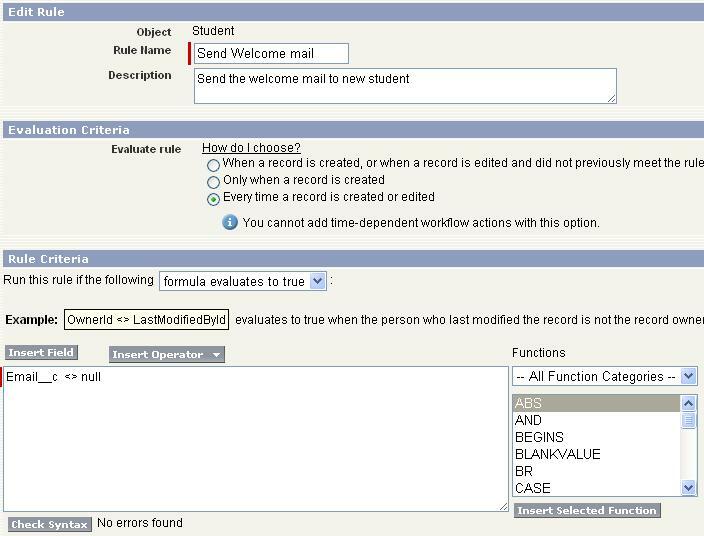 Every time a record is created or edited: Choose this option to include new records and updates to existing records and repeatedly trigger the rule, even if the record still meets the criteria. You cannot add time-dependent actions to the rule if you choose Every time a record is created or edited. Note : You can’t add time-dependent actions to a rule if you choose Every time a record is created or edited. So, in step 2 basically we create a criteria when the rule should run. In step 3, we can specify the action what should happen if workflow criteria meets. In this case, i have selected New Email Alert, below screen shot is self explanatory about the process. 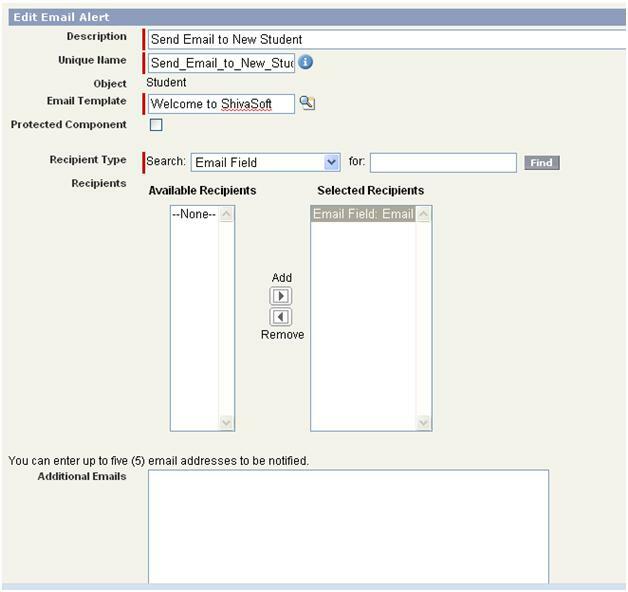 We have to select the recipients for the email, in our case Email field have the email address of the student. We have also selected the newly created email template “Welcome to shivasoft”. In this tutorial, we have covered how to create the Workflow rule criteria and action in salesforce.com. In next part of tutorial, we will see how to create the trigger for our application. Could you please provide me details about salesforce. Go to the Custom Object or Standard Object Page. Now navigate to page layout section and create New Page layout or on existing Page layout click on “Page Layout Assignment” button. Now assign the page to desired profile. Which version of Salesforce do you have ? your profile is “System Administrator” ? I am also facing the same problem. Please help you solved the problem. shud i subscribe 4 dis or wat? hi i am sunil i have done salesforce CRM course and searching for job.but my teacher doestn’t teach properly can any help me by teaching classes.my number 09620599954.i was staying in bangalore.kindly pls help me. how to create record types? those record types are picking from picklist? I am not able to see worklfows in salesforce winter13. Can anyone guide how it can be enabled or let me is there any new functionality to setup workflows in v13. i just started working with workflows can you please help me to write a workflow which will send email to users every friday with the events they did last week and the events they have to do next week. How can i do this with workflow rules?